Here are answers to some common questions about the Reading Course. If you want to improve your reading skills and increase your vocabulary, sign up today! The Reading Course is good for intermediate to upper-intermediate level English students. Advanced students may also benefit, especially from the version of the course that includes teacher correction and feedback of your writing. This course is not recommended for beginners or pre-intermediate students. If you’re not sure about your level, just take the free sample lesson to see if the Reading Course is right for you! Your access is permanent! You can take the lessons anytime now or in the future. If you have any difficulty accessing your course, please email me and I’m happy to help you. WHAT’S THE DIFFERENCE BETWEEN THE TWO PRICES FOR THE READING COURSE? 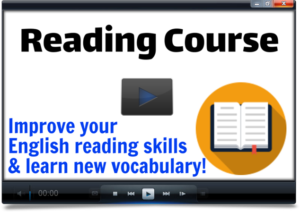 The Reading Course has 40 lessons – each lesson includes an article and worksheet with a comprehension quiz and vocabulary exercises. The lower-priced version of the course contains these 40 lessons. The higher-priced version of the course contains the same 40 lessons PLUS each lesson includes an additional writing task, where you can send me your text for correction. This is a great way to get direct feedback from an English teacher! How long does it take to get teacher feedback after I send in my writing task? I correct homework as fast as I can, but sometimes it takes a little longer if a lot of students send work at the same time. You can continue to the next lesson even if you haven’t received my feedback yet. I always respond and I correct the homework in the order it was submitted. Can you correct my essay / letter / other text that is not related to the course? Sorry, I can’t do that. I only provide correction for the assignments inside my courses. What are the lesson topics? Will this course help me for the IELTS / TOEFL / TOEIC / Cambridge exams? How much vocabulary will I learn in the Reading Course? How is it different from your Vocabulary Builder Courses? 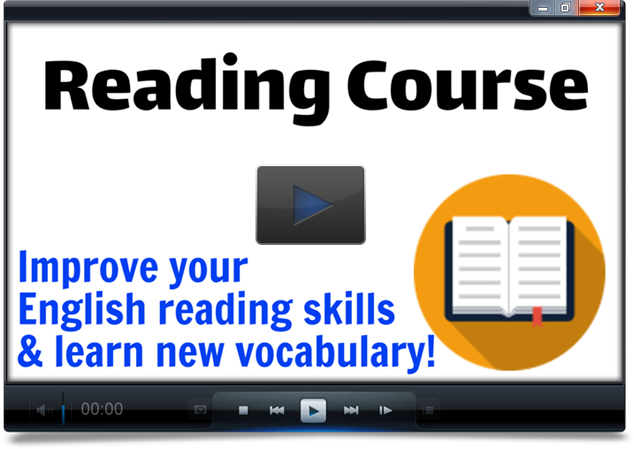 You’ll learn more than 1,000 words in the Reading Course! Most of these words are different from the ones in my Vocabulary Builder Courses. The lesson format is also different – the Vocabulary Builder Courses teach groups of related words more directly, and the Reading Course teaches you words in the context of the article.